Lester TERRY was born in 1903 in South Carolina, likely Richland County. He was the 7th of eleven children born to John D. TERRY (1874-1942) and Maria MARTIN TERRY (1874-1950). Mariah was the sister of my great-grandfather, Adolphus B. MARTIN (1867-1917). This makes Lester my first cousin, twice removed. 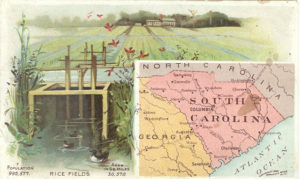 Lester’s father, John, owned and farmed land in the Center Township of Richland County, specifically where Ft. Jackson would be built in 1917. John’s land was ‘about 11 miles from Columbia on the old Camden Road’ according to an article in The State newspaper. In 1910, Lester was 7. He didn’t attend school yet but helped on the family farm. Father John was general farmer who owned his farm and employed others. Narcissus MARTIN (Maria’s brother) and Willie TERRY (John’s brother) are on the same page in the 1910 census. Narcissus and Willie were also farmers. Below is a photo of the Ft. Jackson landowner’s map that shows how close the families lived to each other. The green arrow is John and Maria’s farm. 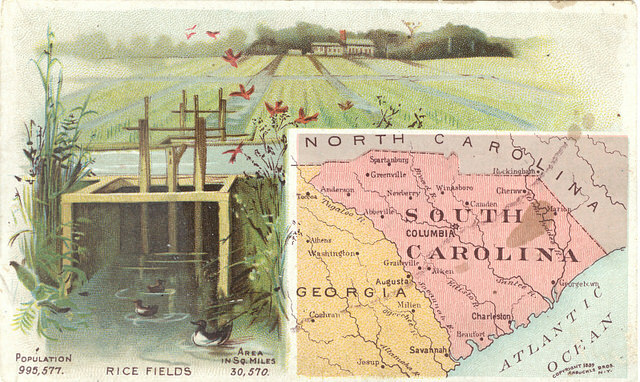 The yellow arrows are Narcissus’ and Willie’s farms, and the farm of my great-grandfather, Adolphus, who had already passed away when this map was made. 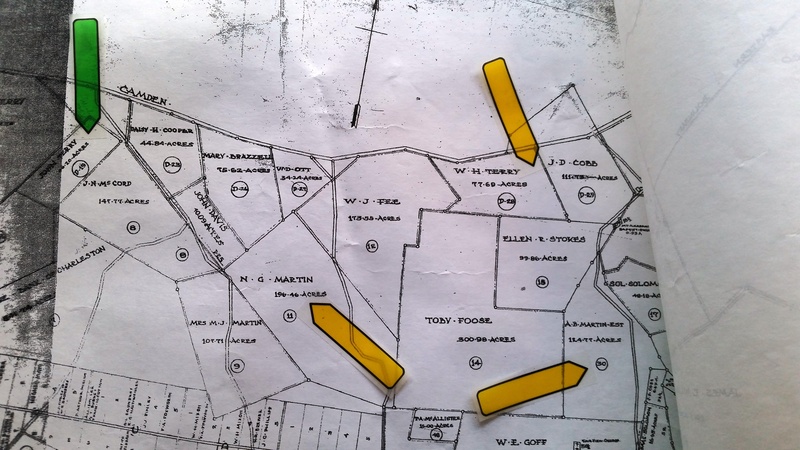 A photo of a portion of the Fort Jackson Landowners survey map showing the location of John’s farm in relation to other family members. In 1920, John was still farming on his same land but now he’s farming for a cannery. His land was on the edge of the Ft. Jackson land. Lester was 17 in 1920. He attended school and could read and write, and he continued to work on the family farm. In 1930, John was still farming the same land. The census states that the land was on the Ft. Jackson reservation. Lester, 27 years old now, is not listed as living there, but I can’t find him anywhere else in the census, so I suspect he just wasn’t there the day of the census. In the early 1930’s Lester would occasionally go into Columbia on Saturday and stay overnight at a boarding house at 922 Gervais Street. The house is still there. Click here to see it. June 10, 1933 was one of those Saturday nights. According to The State, Lester got up Sunday morning and went to a café for breakfast and later returned to his room at the boarding house on Gervais Street. In the early afternoon, two shots rang out in the boarding house. The proprietor of the house called the police who arrived to discover that Lester had shot himself through the heart with a .32 caliber pistol. He was still alive, and an ambulance was called. Unfortunately, Lester died on the way to the hospital. Lester was buried on 12 June 1933 at the Enon Methodist Church on the old Camden Road. If he is truly buried there, he doesn’t have a stone. The pallbearers included men with surnames I recognize as Fort Jackson landowner surnames: Henry T. MILES and Dalton J. MEDLIN. Was it a broken heart? Despair because of the Depression? A falling out with a loved one? We’ll never know. Several people commented about the possibility of Lester shooting himself twice in the heart, and questioned that the shooting may have been foul play. While reading up on self-defense, my husband came across an explanation as to why it’s best to aim for the head. A person doesn’t necessarily die instantly from a gunshot wound to the heart. A person can live up to 30 seconds, so a perpetrator could have that extra time to shoot again. That’s why you aim for the head. Keeping that in mind, Lester could have lived long enough after the first shot to shoot himself a second time. Wow! What a sad and mysterious turn of events. You know, I wonder if the note he wrote remains in a police archive as part of the investigation into his death? Michael, that’s an interesting question! How bizarre that he would go out for breakfast and then shoot himself when he returend. We need to get Longmire on the case! PLUS, I’m thinking “How could he shoot himself TWICE in the heart?” This case is very suspicious. Wouldn’t it be great to get a hold of that suicide note (which could be forged) and solve the “cold case?” Or do I just watch too many detective shows? I was thinking about what a bad shot he was to have to shot himself twice in the heart. The case is suspicious, yes. He could read and write, so maybe his parents identified the handwriting as his. I still want to know what made him do it. There’s more to the story, for sure.